The Foodies and Friend were out on a photo shoot and stopped at Cafe Habana in Malibu for lunch. We all chose the Eloté (Mexican Corn) and their Fish & Chips appetizer. The corn, as always, was excellent, although we felt our version was somewhat better as we fully grill the corn (as opposed to boil first then a quick grill). The mahi mahi fried fish had the lightest tempura-style batter and was probably the best fried fish we’ve had. We forgave the undercooked fries as a “bad day” in the kitchen. A great meal for $23.58 per serve. For dinner we returned to a favorite: top sirloin with peanut sauce. Tonight Foodie Greg built a salad out of what we had in the refrigerator: bean sprouts, watercress and cucumber in a tasty dressing. Add 20c for dressing ingredients. The steak (from our Keller Crafted meat delivery and therefore dry aged) was flavorsome and tender and perfectly grilled. The peanut sauce is a great spicy accompaniment which the wet salad ingredients perfectly offset. A great meal for $4.87 per serve. Two very different sandwiches today: one with caramelized pork from dinner a couple of nights ago with garlic spread on one and a tuna pouch with Swiss cheese (for a “tuna melt”) on the other. Add 35c for garlic spread and butter. Today’s sandwich cost $2.87 per serve. Tonight was the 18th Birthday for LACPUG in Los Angeles and the Foodies have been there since almost the beginning, so the night ended with our traditional pizza for $10.00 per serve. While the weather has warmed up, we’re still enjoying toasted sandwiches for lunch as toasting the bread transforms it in a very positive way. Today we took some of the chili from a couple of nights ago and combined with a slice of Swiss cheese. Today’s sandwich cost $1.70 per serve. Tonight’s salad was designed to feature the burrata and was created by Foodie Greg as a riff on a Cobb Salad. 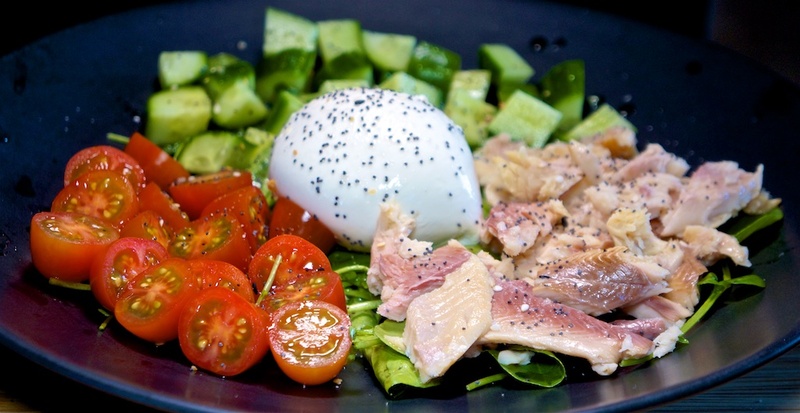 Dinner tonight was a good combination of smoked (and a little dry) trout with the freshness of the cucumber and tomato and creaminess of the burrata. The sprinkling of “Everything but the Bagel” spice (Trader Joe’s) really melded the dish. We enjoyed it for $7.42 per serve. Today’s toasted sandwiches featured a Tuna and Sun Dried Tomato pack in a pseudo tuna melt, and pastrami and sauerkraut. Both were fine lunch choices. Add 45c for butter and garlic dip. Lunch today cost $3.95 per serve. 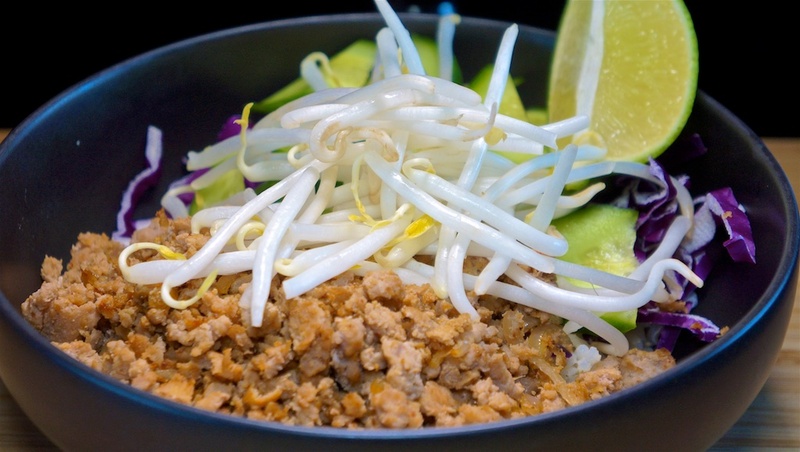 One of our culinary challenges is how to creatively use ground pork. We usually get one (or two) pounds of ground pork in our Keller Crafted meat box, but we don’t want to cook the same food all the time. So, tonight we tried Vietnamese Caramelized Pork Bowls. We cut the sugar back from five, to two tablespoons. We purchased shredded red cabbage for $1.49 and used half, or 38c per serve. The caramelized pork had great flavor and was nicely offset by the fresh ingredients in the bowl. Plus we have ground pork for sandwiches. A good meal for $3.64 per serve. For lunch Foodie Greg wanted something “eggy” so we got scrambled eggs with some leftover grilled asparagus and spring onion, over Wild Caught Smoked Salmon, served on a piece of “fry bread” (bread toasted in the panini press). Add 50c for heavy cream, seasoning and spring onion. The eggs were perfectly creamy, having been pulled off the heat just before they were ‘ready’ so that the remaining heat would carry them to temperature. The grilled asparagus and spring onion bought a little flavor and crunch, while the smoked salmon stopped the fry bread from going soggy under the scrambled eggs. An excellent meal for $5.37 per serve. Tonight’s Duck Massaman Curry was prepared yesterday and let sit overnight so it was able to get a long, slow cook, which made the duck tender enough to cut with a spoon! The massaman curry had a totally different flavor with the change in protein. We felt the duck fat softened the curry heat a little and made the flavor more subtle, but more interesting, than when made with beef. A really excellent meal for $8.67 per serve. We’d been threatening a Bahn Mi several times this week, and today we had it. As always, a great sandwich for $8.75 per serve with tax and tip. Tonight we returned to the “too hot to handle” green curry of a few nights ago. 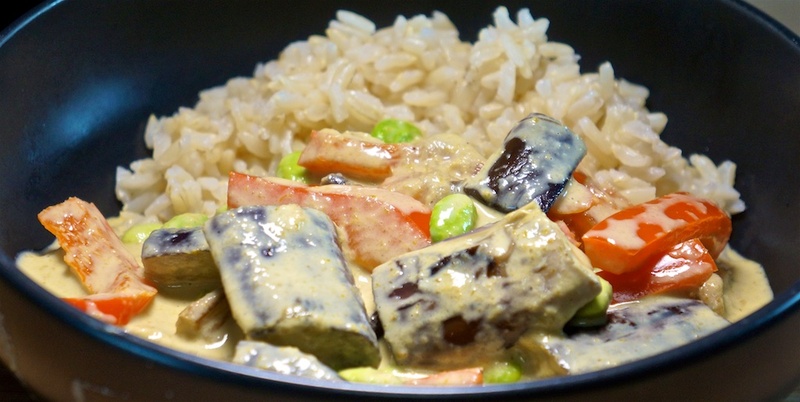 The addition of additional coconut milk and bamboo shoots softened the heat somewhat, but also diluted the flavor. I don’t expect we’ll buy this green curry paste again. The result was an okay meal, with the flavor diluted in order to make it edible, for $5.87 per serve. We baked off some rustic panini rolls and stuffed them with the remaining sliced roast beef (top sirloin from the Chateaubriand) and spread the roll with home made relish (Philip’s brother) and the garlic spread. It was a really tasty lunch. A really good lunch for $2.77 per serve. The Foodies ate apart tonight as it was Editor’s Lounge night for Foodie Philip. Food is provided at Editor’s Lounge. Once again, we baked off some rustic panini rolls and stuffed them with the some sliced roast beef (top sirloin from the Chateaubriand) and spread the roll with home made relish (Philip’s brother) and the garlic spread. Thursday night steak night on a hot night is always a challenge. 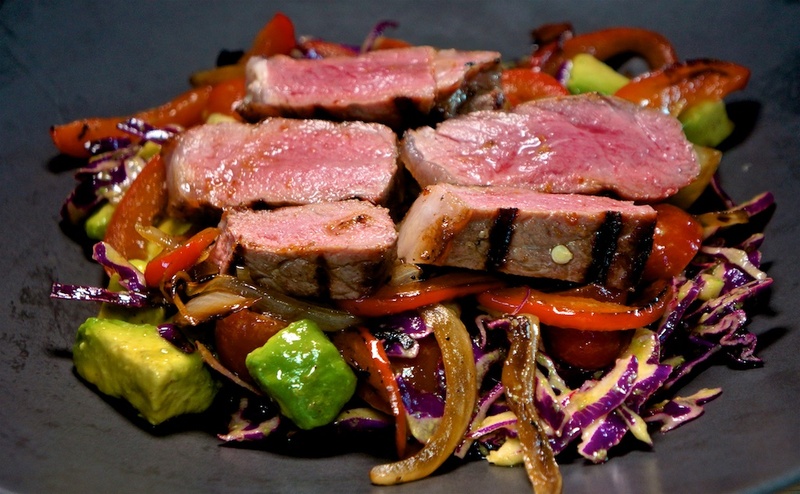 One easily met with a Fajita Steak Salad! The onions and peppers were first sautéed on a cast iron griddle to soften and enhance flavor. Add 50c for seasoning and dressing ingredients. The onion and peppers were exceptionally good and reminded both of us of an Australian BBQ where onions were always cooked on a steel flat top. The cabbage provided a crunch missing from the other ingredients, but otherwise seemed superfluous. The dressing provided a nice tangy balance. A good meal for $12.99 per serve. Jun 20: The Country Deli; A “too hot to eat” Curry! For lunch we went to The Country Deli at then end of another errand. Both of us went with our regular choices: Pastrami on Rye for Foodie Greg and the Marinated Skirt Steak, Eggs and Home Fries for Philip. Lunch at The Country Deli runs $21.62 per person (average) with tax and tip. Foodie Greg prepared a Green Curry from the sample pack of curry pastes we recently purchased. For a couple of reasons it turned out to be very spicy! Too hot to eat as it turns out. Neither of us could manage more than a couple of mouthfuls. So we skipped dinner after a large lunch. The curry will probably be redeemed for a later meal. Author PhilipPosted on June 21, 2018 Categories Daily recipeLeave a comment on Jun 20: The Country Deli; A “too hot to eat” Curry! Since we had fresh grilled asparagus left over from two nights ago, we decided to try the asparagus and Swiss that we’d been experimenting with using canned asparagus, again with fresh. It made a huge difference! The fresh asparagus is a way better than canned and a pretty decent sandwich for $1.56 per serve. For dinner we repeated the chili with avocado and labné for $3.22 per serve.